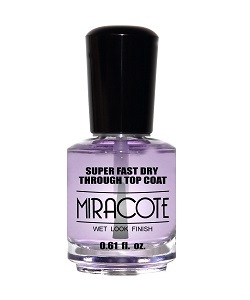 MIRACOTE by duri is a powerful super fast, dry-through, topcoat formulated with a new generation of low viscosity solvents that glide easily over nail polish. MIRACOTE quickly penetrates and dries nail polish down through each layer to the bottom base coat, creating a resilient, durable seal and magnificent gloss finish. MIRACOTE is a non-yellowing and completely formaldehyde-free formula that seals and protects nails from chipping, leaving nails better able to cope with daily wear and tear. MIRACOTE has been specifically formulated to retain its low viscosity formulation and consistency — totally eliminating the need to “thin” or add solvents to the bottle over time. Begin with clean, dry nails. Apply base coat and two coats of nail polish. Then apply one coat of Miracote. In no time you are ready to go!